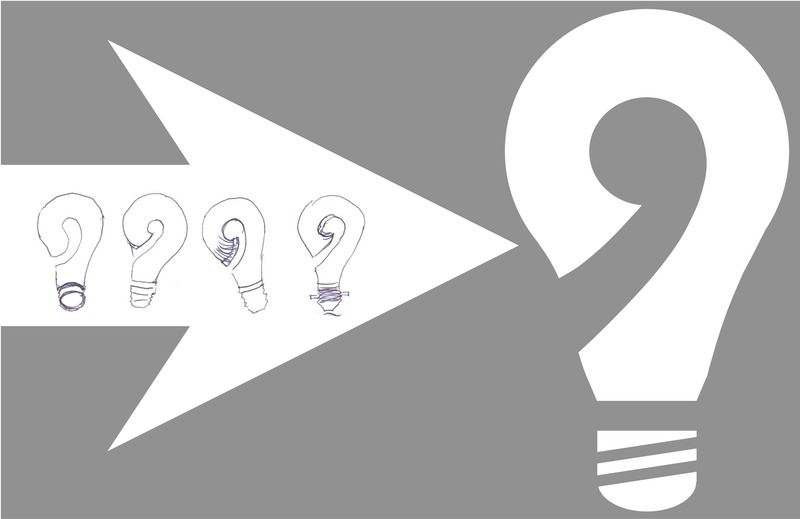 I’ve designed 100s of logos over the years but this is the design I’m most proud of: an elegant mix of a Question Mark – Koru – Light Bulb all combined into a simple shape, done for my wife’s business card & website in March, 2008 – definitely from the creative department! I share a lot of myself in the process of blogging but rarely do I talk directly about me – Dennis on Dennis sort of thing. Blogging such as “”I got up, had cornies for breakfast and the dog was sick” just turn me right off! This post however is different . . .
. . . and discusses the aspect of creative-giftedness that I have that confuses people, especially those who are quick to judge (hint, hint Samoa!) or those who don’t actually stop to think for a minute or to ask questions. The post has been triggered by an article sent to me from someone who knows me, particularly my creative side. It is a summary of ten characteristics of creative people written by Faisal Hoque who quoted a guy whose name is worse than the PM of Samoa, a distinguished professor of psychology and management Mihaly Csikszentmihalyi (pronounced me-HIGH chick-sent-me-HIGH-ee). seminal book Creativity: The Work and Lives of 91 Eminent People (HarperCollins, 1996). I generally peruse lists like this and compare myself with the points mentioned, then ususally say to myself, “Ho hum! Yeah, but so what?” and then carry on with life as before, but this list hit the nail on the head with a score of 10/10 and is written by a clear genius himself so is worthy of sharing further. I quote the author on each point and then apply it personally. Enjoy! 1. Creative people have a great deal of physical energy, but they’re also often quiet and at rest. They work long hours, with great concentration, while projecting an aura of freshness and enthusiasm. Yup – check! My rest time from physical or human relationship ‘work’ comes as I write, which is often a creative process in itself including also prayer and reflection. Playing the piano, fishing and wood-turning too have the same relaxing effect for me, although the latter two are pretty much historical activities. 2. Creative people tend to be smart yet naive at the same time. The description from the author fits, but the summary phrase is a little off-putting. I think the word ‘naive’ is a little strong but the idea that we creatives are so totally focussed on one aspect of life at one time gives others the impression of naiveity. For example when making a point, be it teaching or in sales, we are not always ignorant of political or commercial by-products of our words or conduct, it is more that we value the subject at hand much more than consequences. Others would ‘play the game’ to secure commercial benefit or political gain. We don’t for our values are different. Naive to the outsider – perhaps. Naive at the immediate point of conflict – perhaps a little, but naive overall – not really so. 3. Creative people combine playfulness and discipline, or responsibility and irresponsibility. But this playfulness doesn’t go very far without its antithesis, a quality of doggedness, endurance, and perseverance. The way I combine work and play is to deliberately choose to do work that I enjoy, thus I can never tell if or when I am working, doing ‘ministry’ work or just playing and having fun. A curious off-shoot of this is that this makes it impossible for me to honour the Sabbath literally because I don’t know what ‘work’ is but as I’m not an SDA nor bind myself to legalistic religious rules I am free to live – well – freely! When someone can tell me which part of my life is actually work and which part of it is rest or fun, then I will be able to honour the Sabbath properly! I’d like to apply this concept of playfulness vs dogedness to my hot-buttons, learning and specifically learning the truth. Over the years, many have found to their peril that I simply do not give up so in this regard I know perfectly well the difficulty that Ucello’s wife had. She was clearly on a hiding to nothing attempting to break into her husband’s creative process, and would have failed, constantly. People who attempt to change me or manipulate me generally fail in their objectives too. It’s why over the years the Jehovah’s Witnesses constantly give up on me, despite my enthusiastic invitations for them to come back and talk to me about Jehovah as often as they like! Call it stubbornness if you will, but I prefer to call it backing myself. The point here is that if we put enormous effort into a certain piece of creativity or learning, and if we DO create or learn something then we are just stupid not to back ourselves in what we have done, created or learned. Giving up, which may be viewed as simply quite pragmatic to many, is to us a deeply personal crisis of identity. Living in an environment where we are often misunderstood, sometimes one of antagonism, sacrificing something that we view as a part of our identity is simply not an option. This situation is deepened still further when our faith is mixed into the equation. If we align something with our faith in God (as I do for example by viewing truth as godly) then our “doggedness, endurance, and perseverance” will be greater than even love of our own life. 4.Creative people alternate between imagination and fantasy, and a rooted sense of reality. Great art and great science involve a leap of imagination into a world that is different from the present. Touche, touche, touche. A visionary (like me) MUST have a strong grasp of reality, as well as the capacity to see things how they COULD be in the future. To have one with out the other is ultra dangerous. If we have no grounding in reality and dream dreams we live in the world of ‘syhooks’ where nothing we say can ever make sense and we will find ourselves in a physical lock-up as society ring-fences us for our crazy dreams. If on the other hand we have a great sense of reality (pragmatism) and no imagination we are equally entrapped into a wall of negativity, often depression and mediocrity. As the Good Book says, people without vision will perish. The lot of a dreamer is to be a social outcast. The lot of a realist is social acceptance yet brings an internal death – of the spirit. Mature creatives learn to blance vision and reality very well, just like the authors say here. I just love the way that I can see things into the future – ideas, plans, opportunity . . . yet at the same time accept the reality and work hard, day by day doing the needful to prepare for that day in the future when the ideas all come to fruition. Mihaly is dead right about how we ‘creatives’ can have strong vision. 5. Creative people tend to be both extroverted and introverted. We’re usually one or the other, either preferring to be in the thick of crowds or sitting on the sidelines and observing the passing show. Creative individuals, on the other hand, seem to exhibit both traits simultaneously. Check! I fail all tests on introvertedness/extrovertedness as I am neither one nor the other, but I’m both at the same time! Please let me explain . . . as a child, teenager and young man, I had a chronic self-esteem problem. Yes, chronic! If you really want to know why, it was most likely because my father never actually said, even once, “Well-done son!” or “I love you!” or “I’m proud of you!” Now this is no cop out as an adult but it was the cause; the reason. I’ve since learned to ride over the influence of that style of upbringing and to grow up. The legacy of those times will always still be there BUT the outworking of that issue is that now I can and do walk into any village, home or office in Samoa (a culture and place so foreign to me naturally that you just have to laugh at the whole thing to be quite frank!) and sit down and talk to people about themselves and their life and culture without batting an eyelid! I write material about Samoa and the Samoan culture that Samoans would fear to even speak aloud, let alone in public, AND in writing to boot! So, there you have it – a mixture of both introversion and extroversion – all day, all night, the same! 6. Creative people are humble and proud at the same time. It is remarkable to meet a famous person who you expect to be arrogant or supercilious, only to encounter self-deprecation and shyness instead. This is true, but from the Christian world-view I would put it slightly differently . . . we are ALL proud people (creatives and others) and the global challenge is to learn to deal with that. As we grow in confidence of who we are (the Christian faith talks of knowledge of who we are ‘in Christ’ which is another way of saying that we recognise more and more of His love for us) then we can become more humble in our self-knowledge. The more that we know that we ARE special, that we ARE unique, capable or gifted, the easier it is to choose to BE humble about it. It’s often the insecure people who (again to be frank) are the losers of this world who need to puff themselves up and lord it over others. So this point is a ‘check’ for me but from a different perspective – not especially through the creative side of ones’ makeup, but through increased self-knowledge and deliberate choice. 7. Creative people, to an extent, escape rigid gender role stereotyping. When tests of masculinity and femininity are given to young people, over and over one finds that creative and talented girls are more dominant and tough than other girls, and creative boys are more sensitive and less aggressive than their male peers. Check! I am strongly hetrosexual, make no mistake about that, but there is a sensitivity, understanding and aversion to physical conflict that belies my masculinity. If according to Mihaly this is an attribute of creative-giftedness, then so be it. I’m one of them! 8. Creative people are both rebellious and conservative. It is impossible to be creative without having first internalized an area of culture. So it’s difficult to see how a person can be creative without being both traditional and conservative and at the same time rebellious and iconoclastic. That’s a new word for me although I’ve heard it before I had to look it up. Iconoclastic means being a rebel against institutions. ( www.thefreedictionary.com/iconoclastic ‎) i·con·o·clast ( -k n -kl st ). n. 1. One who attacks and seeks to overthrow traditional or popular ideas or institutions. 2. One who destroys sacred religious images. I’m checking this one off as a ‘yes” but with a BIG proviso, and one that I think the author(s) have got slightly wrong. The key point here is motivation. I can’t speak for others, but I have a deep desire to fit in, and seek peace in the world. I would love to be able to sign up to a cause, system or tradition and in fact for decades did exactly this, with adherence to mainstream traditional orthodox, insitutionalised Christianity in New Zealand. I attended, committed to and supported a wide range of churches and doctrines over the years, so my HEART is to conform. The problem however, and this is the biggie, when push comes to shove any system must protect itself otherwise it doesn’t exist. This applies in the animal and plant kingdom as well as politics and human relationships. Be it a plant protecting itself from mutation or an animal group protecting its own, or the human body defending itself against bacteria, viruses, injury or even invading titanium/steel implants or any social institution like a business, club or church denomination – all these systems must protect themselves or they will cease to exist. Free thinkers and creatives like me inevitably come up against the control and defense systems that prevent us being who we are – creatives. So our hearts are conservative, yet our nature is to question, to think and to explore. In the context of tradition and an institution, we are therefore seen as “rebellious and iconoclastic”. So, begrudgingly, yes, check . . . the cap fits! 9.Most creative people are very passionate about their work, yet they can be extremely objective about it as well. Check! Passion is my middle name. All these words connect perfectly, and I think this is one of the keys to my success, whatever you assess that as . . . for the passion that exudes from a creative; the self-belief that drives us no matter the odds, the energy that exudes from a creative creating can be mesmerising to the majority who are, if we are honest about it, desperately looking for answers, for hope, meaning and purpose in their own lives. I know very well how compelling passion in others is, especially to those caught in the mire of mediocrity. 10. Creative people’s openness and sensitivity often exposes them to suffering and pain, yet also to a great deal of enjoyment. True! And with that sombre thought comes the final “check!” from me . . . 10/10. Openness . . . sensitivity . . . suffering . . . pain . . . yup, but as the man says, also ‘a great deal of enjoyment’. While I love creating, for me though the utimate goal is not actually to create – it is to be obedient. I want most of all to hear the words, “Well done good and faithful servant!” when my time is up on planet earth. In fact I want to hear those words daily and hourly too! I actually really don’t care if none of my ideas is implemented. It’s not important whether I create 100 ideas that have legs or even just one that takes off and impacts millions but it is important to me that I do what I was created to do. As a creative-gifted guy, (supposedly called to Samoa in 2009) then it is an enormous sense of satisfaction that I can create things here in Samoa, and hopefully bring blessings to the ultimate creative-gifted Creator who I know, love and model my life on! Why not have another look at that tricky logo that includes three things into the design, then go and create something yourself now too! The greenhouse effect caused by man-made CO2 is less than 1 percent of the total and may be a small fraction of 1 percent.